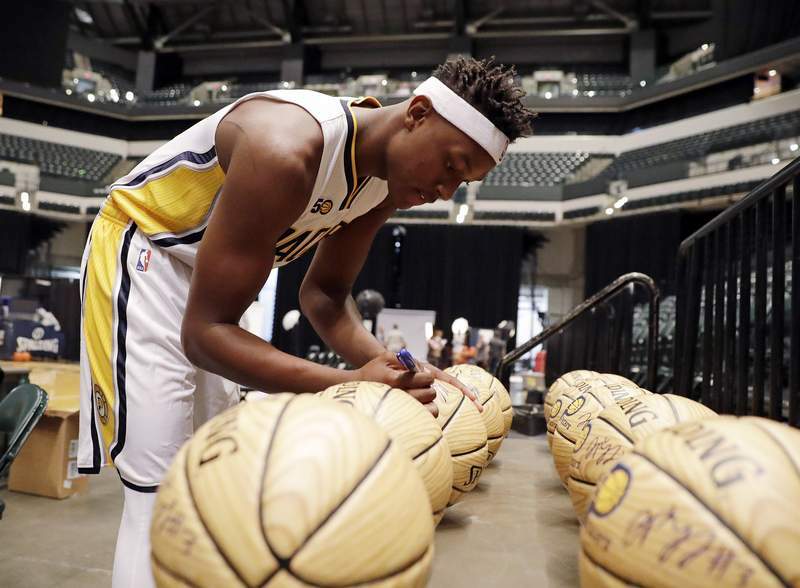 Associated Press The Pacers’ Myles Turner signs autographs during the team’s media day Monday in Indianapolis. INDIANAPOLIS – It’s the time of year in which the optimism is overwhelming, every new player is lauded as being a perfect fit and every NBA team thinks it’s destined for the Larry O’Brien trophy. On Monday at Bankers Life Fieldhouse, the Indiana Pacers prepared for today’s opening of training camp by boasting the following: new coach Nate McMillan said the long-promised fast-paced offense will come to fruition; Paul George claimed he is indeed a top-five player in the league; new acquisitions Jeff Teague, Thaddeus Young, Aaron Brooks and Al Jefferson called Indianapolis an ideal landing spot; and everyone raved about the depth. Of course, almost no one was thinking about ending up in a Mad Ants uniform, but McMillan probably tipped his hand on who will be in Fort Wayne when its D-League training camp opens Nov. 1 by saying the Pacers’ starting five is set with Teague, George, Young, Monta Ellis and Myles Turner, to be backed up by Brooks, Jefferson, Rodney Stuckey, C.J. Miles and probably Lavoy Allen. "We’ve got a lot of guys in their prime," said McMillan, whose Pacers went 45-37 last season under Frank Vogel, finishing seventh in the Eastern Conference before losing a playoff series to Toronto. "We’ve got a lot of hungry guys … and these guys want to be a part of a winner. Hopefully, they want to win big." A betting man would say the Pacers will send to Fort Wayne undrafted rookies Nick Zeisloft of Indiana and Alex Poythress of Kentucky, Julyan Stone and either Rakeem Christmas, Joe Young or Georges Niang. If the optimism about talent and depth is warranted, then it bodes well for the Mad Ants, going into their second season being owned and operated by the Pacers. On the heels of the 2014 D-League championship and a trip to the 2015 finals, the Mad Ants went 20-30 last season, lacking players who could be counted on in crunch time and getting surprisingly little help from the parent club. Christmas averaged 13.9 points and 7.1 rebounds in 48 games his rookie season but sagged down the stretch. Shayne Whittington had 12.1 points and 7.9 rebounds over 40 games but was released by Indiana. Young played only three D-League games and Glenn Robinson III played only once, in a season that was jarring for fans who didn’t get to see the winning to which they had grown accustomed. Admittedly, the Pacers were still trying to figure out how to use the D-League late last season. Mad Ants coach Steve Gansey, who has been assisting McMillan the last six weeks, believes it’s now a more well-oiled affiliation. The Mad Ants will continue to run the Pacers’ systems, but there is a greater understanding that it won’t always make sense; without a star player a la George, it’s impossible to replicate some of the offense. "If guys are assigned, we want to make sure it’s an easy transition for those guys, especially at the defensive end so they have the same verbal cues," Gansey said. "(Pacers president) Larry Bird and the rest of the front office want to see a certain style of play. … Just watching these guys play pickup, it’s really exciting. They’ve been playing pickup with 16 seconds on the shot clock, just to try to speed up things and that’s something that I’ll probably do also." Gansey said even he’s almost totally in a "Pacers mindset" right now and that the players need to be, too. Time will tell if the Pacers are so deep that it will be seen in Fort Wayne. Justin A. Cohn has been covering sports in Fort Wayne since 1997. He can be reached by email jcohn@jg.net; phone, 461-8429; or fax 461-8648.